This malty yet well-balanced Maerzen-style Lager is easy to drink but difficult to pronounce. 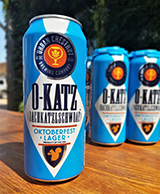 That’s why Oachkatzlschwoaf (“owah-kaatzl-sch-woaff”) is lovingly referred to as “O-Katz” by our staff – because only our Bavarian-born Brewmaster can pronounce its name correctly. We all agree Bavarian humor can be…interesting.